Orlando is out. Jacksonville is finalizing plans to move to another league. Strong Rumors have Gene Simmons and Paul Stanley leaving Los Angeles. Portland has been a league afterthought for nearly a year. For all intents and purposes, the Arena Football League is dying. In the very least, it is very sick. Today, the Orlando Predators announced that they are ceasing operations, citing a lack of the league attracting new ownership and "disagreements" with the AFL. The Predators decided to leave "due to the reduced number of teams remaining in the Arena Football League as well as pending disagreements with the League. Over the course of the past several years, we have focused on building and growing our winning franchise despite significant issues at the league level that have impaired our ability to be successful.'' The statement was posted on the league website. Predators officials are tight-lipped about whether it will return at some point in the future, or whether the Predators will move to another league. "I've said all I can say at this time,'' team president Jared Saft said. More information is available regarding the Jacksonville Sharks who announced on their website today that they are, indeed, finalizing plans to switch to another league, though they did not say which league that might be. "It became quite obvious over the last couple of years we were going to a rival league. Constantly growing league expenses and the lack of revenue led to crippling operational costs of AFL teams. Now was the right time to move the Sharks into an exciting new league that will become the premier league in arena/indoor football," said Sharks operating manager Jeff Bouchy. "Other teams from the AFL are expected to join us in this new chapter in Sharks' history." UPDATE: Arizona Rattlers officially leave AFL to join IFL. Bouchy could be talking about the Predators, for one. The inquizitive mind would certainly recognize the plural in his statement and wonder, Who else? Multiple reports (as well as flurry of rumors) have indicated that the principles behind the Los Angeles KISS, Gene Simmons and Paul Stanley of the band of the same name are walking away from the team. The team was intended to be part of the band's brand, but never truly made an impact in it's three seasons in the AFL. No official announcement has been made regarding the KISS, but things likely do not look good given today's news from the Predators and Sharks. Add to the mix of uncertainty the Portland Steel. Make no mistake, the Steel are not nor ever have been Portland's team. The Steel have been commissioner Scott Butera's team since he took over control of the franchise from Clackamas, Oregon businessman Terry Emmert on January 6 of this year. Emmert hinted at the takeover, citing differences with Butera and the AFL over lack of proper insurance for players, as well as the league's inability to attract and sustain sponsors. Simply put, Emmert's Portland Thunder were Portland's team. The Steel were Butera's team. The commissioner has repeatedly said that the league likes the Portland market and wants a team there. The unsaid truth is that Butera took over the Portland franchise for one reason and one reason only: it was to fit his business model for league ownership; specifically to attract NBA and NHL team owners into the AFL. Even more specifically, he wanted Portland Trail Blazers owner Paul Allen to take over Portland's AFL franchise. That was never a possibility. Allen's goal was to earn income by selling arena dates to entities such as Emmert's Portland Thunder. He never had any intention of incurring that cost himself. That much is known for sure. That much is even more well known by those in the region who actually have a clue about Portland sports and Allen's intentions. No formal announcement has been made regarding the actual future of the Portland Steel. In last season's eight-team AFL, the other seven owners paid the expenses for what Butera passed off as the operations of the team. If that number were to dwindle to five, I guarantee you that the remaining league owners will not stand for paying for Butera's team in the Rose City. With the departures of the Predators and Sharks, the likely loss of the KISS and the folding of the Steel, the AFL would be down to five teams -- Cleveland Gladiators, Philadelphia Soul, Tampa Bay Storm, Arizona Rattlers and the expansion Washington Valor. The former four are solid to relatively solid within the league. As for the Valor, owner Ted Leonsis has to be scratching his head asking himself what he has gotten himself into. Leonsis actually fits Butera's model as owner of the NBA's Washington Wizards and the NHL's Washington Capitals, as well as the WNBA's Washington Mystics. The Valor are easily Butera's biggest achievement. Of course, it's difficult to gauge the commissioner's achievements due to the extremely small sample size of them. Some claim that all the AFL's ails are to be attributed to former commissioner Jerry Kurz. whom Butera replaced prior to the 2015 season. The major criticism is that he rushed expansion teams into the league before the teams and league were properly ready. Much of that is true. There are certainly examples; the ill-fated Las Vegas Outlaws is the prime of these examples. Most critics also include the Portland Thunder on that list. While the Thunder got a late start, there is no legitimate reason to think that it could not have turned out to be a thriving franchise had it been operated adequately. Kurz had his faults and his judgement lapses, but those who criticize seem to never give him the credit for resurrecting the AFL after it had ceased its operations following the 2008 season. Ironically, those who criticize would not have had the opportunity to do so had he not brought back the AFL. For the Thunder's sake, Emmert is not perfect. His constant hiring and firing of team presidents and coaches was meddling on steroids. Had he simply let his employees under the Thunder brand do their jobs, the team could have been much more successful than it turned out to be. For all that, however, Emmert was very effective at spreading the word about the team and drawing in fans. His concerns over Butera's player insurance policies and lack of corporate sponsorships are valid. Also valid are concerns over expansion. Prior to the 2016 season, it was announced that the league had three domestic expansion opportunities. The Valor turned out to be one. Despite rumors of new franchise popping up in San Antonio or Sacramento, nothing seems to be imminent. It was also said that through a Hispanic entertainment network (which turned out to be Univision), there were plans in the works for 2-3 teams to be owned and operated by the network, each based in Mexico. Shortly after the beginning of the 2016 season, Univision and the league announced that the network wold televise a Monday night AFL game. In turn, the league rescheduled one of it's weekly games to Mondays. The Monday night broadcasts lasted a few weeks before Univision decided broadcast the games on a tape-delay the next day at 11 a.m. Univision was clearly unimpressed with its response to televising the AFL. By response, clearly we're talking about ratings. It is abundantly obvious that any potential expansion through Univision is a Butera pipe dream. The commissioner talks a good game. But, if you really listen, he actually says very little. Certainly, there is nothing of substance. If Butera cannot even keep the teams in his own league from bolting, how can he be expected to draw new teams into the league. The more teams which leave, the harder it will to attract new teams into this dying league. 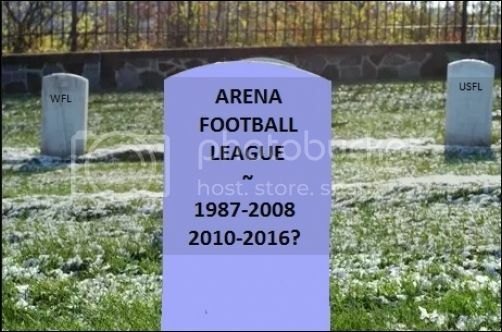 Yes, the Arena Football League is dying and Butera has turned out to be its Grim Reaper. We already know Jacksonville is leaving for a "rival" league. It is pretty easy to see that Orlando will follow. The KISS may not join another league, but they will fold. With no realistic ownership possibilities (Butera claims there are conversations ongoing, but he's been saying those things since January), the Steel are done. Jacksonville officials say they could have an announcement as early as next week. Others such as Orlando may take a while. Geographically, it is unlikely either would opt for the Indoor Football League nor Champions of Indoor Football. Both leagues are run solidly and looking for strong expansion. Both leagues are patient about such expansion. Both leagues are essentially, at least at this point, Midwest leagues with the IFL predominantly in the northern portion of the region and the CIF predominantly in the southern portion. They co-exist admirably. So, a couple of Florida teams will join one of the other leagues, most likely in their region. Makes sense. My guess would be any league which is based in the Southeastern United States, though there are some rumors which, indeed, have them going to the IFL. Meanwhile, the departures of Orlando and Jacksonville leave the AFL with one remaining team in Florida: the Tampa Bay Storm, which is coming off its worst season since the team moved from Pittsburgh in 1991. Storm president Derrick Brooks expressed disappointment at the loss of the Predators and the long standing War on I-4 rivalry, but has stated the team "will continue to support the Arena Football League and are looking forward to the upcoming 2017 season." As for the Thunder, with no Steel to operate in the Moda Center at the Rose Quarter in Portland, Emmert could resurrect the Thunder and take them to the IFL where it would have regional rivals in the Spokane Empire and the expansion Salt Lake Screaming Eagles. Sources have told me this is an absolute possibility. This scenario is, in fact, getting a whole lot of traction. It also would fit Emmert's personality to bring back the Thunder (he still owns the trademark), put them into the IFL, and stick it to Butera and the AFL for their takeover of the team. That leaves the future of the AFL. Remember Bouchy's statement that other AFL teams will follow with migration to rival leagues? Jacksonville and perhaps Orlando, are gone. Others very well could follow. The league would be left with little to nothing. Not a good proposition for a league which is already on the verge of bankruptcy. Again, the AFL is dying. It is time to put it out of its misery, read this league its last rights and put it into the ground. This is more dire than we thought it'd be, right? I'm glad we have the IFL. I don't know much about the CIF but if it's similar, that could be cool. This saddens me on behalf of the players. I know some of them will end up in other leagues. I admire the Steel players for fighting so hard. They never gave up. The same thing for the guys with the Thunder. I'm sorry to hear that this went so wrong so fast.